Each <Bottari> contains its own story. 각 자의 보따리에는 그만의 이야기가 담겨져 있다. 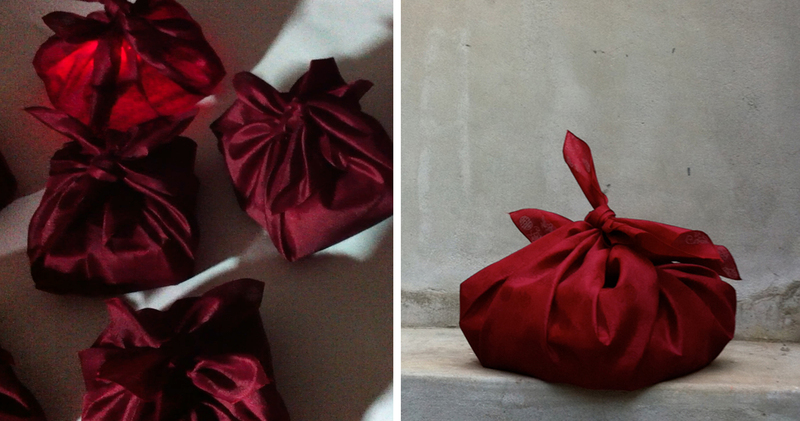 Bottari is a Korean traditional package that is wrapped with a simple square cloth; depending on its content, it can be a luggage for a long journey, a gift for a loved one, or storage for someone’s precious memory. 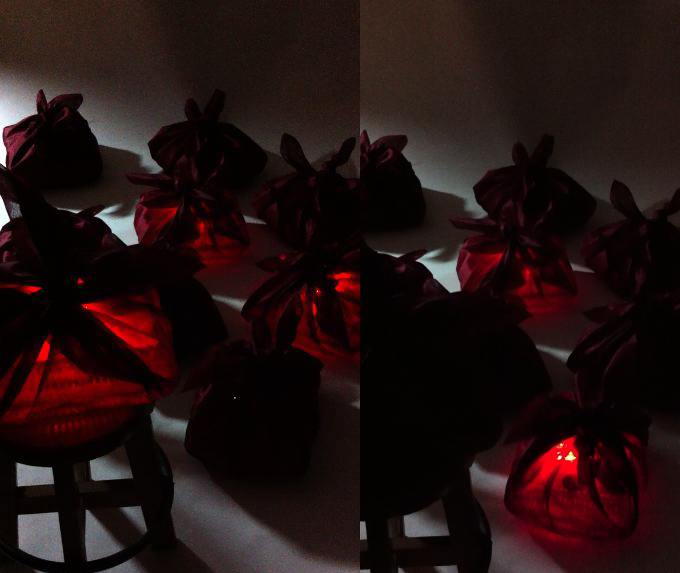 The project “Bottari” is an installation of interactive objects composed with 20-30 bottaries whispering out random poetic words in different voices through the red wrapping fabric. These spoken words in different voices are composed with variation of the subjects, the verbs, the adjectives, and the objectives written by the artist in order to compose non-linear sentences of intended stories. At first, the audience would hear the passing, overlapping random words spoken here and there from the illuminating bottaries but, for some brief moment, the voices of spoken words would complete a sentence together when they are synchronized together unexpectedly, which to be scattered in random words again. The project, “Bottari” is an experimental storytelling objects and environment that deals with a cultural metaphor. The appearance is analogue and traditional but the content is digital and non-linear like hyper textual stories. Everyday thing can contain its own voice and story/memory in relation to the interacting person or owner. With embedded technology in everyday objects around you, interactive art can bring things to lives. A bottari can contain our selected objects in a bundle. In that metaphor, the project, “Bottari” will tell random bits of stories for the audience to compose on their own. The Bottari was the main project during the media art exhibition titled, “Bottari” in April 2011 at Gallery B2Project. It was also exhibited as a part of Seoul Dukksom Park, “Media Circu(it)s” in August, 2011. Tied bundles, the Bottaries are common everyday objects one can easily find in the streets, stores or indoors of South Korea. Any objects become the Bottaries when they are wrapped by a square piece of traditional fabric in shape of a square, called “Bogagi.” In old days, women made Bogagi cloth out of leftover pieces of fabric and recycle them to bundle various things to transfer or store. Today, Bottari often refers to a bundle of contents or context, often as a story or laughter to be unwrapped in Korean culture. Also, wrapping Bottaries means packing to leave. The artist travels very often as she lives and works as a Korean American residing in Korea currently. When she packs a luggage, each trip brings back a full story of her journey. Metaphorically, each bottari has a bundle of story or pieces of memory. When a gift in a form of the bottari was given to her, the wrapping fabric being half see-through in thin shimmering traditional textile, the mystery it contained caught her attention. Since then, she started to reuse the bogagis to carry her stuff around as a bundle. She soon realized what these traditional bundles called “Bottari” mean to Korean culture and how it survived until today as a functional carrier for any contents in different forms and shapes. The artist was inspired to create bottaries that have different stories contained literally. Once a Korean artist, Sooja Kim stated that a bottari is ‘a self-contained world — but one which can contain everything like a vessel, materially and conceptually, since one can tie up a bundle without revealing the contents.’ In the project, “Bottari,” these electronic bottaries will present the contents of stories in voices without actually revealing what’s inside. Inside of each “Bottari,” there is a basket that contains a custom printed circuit board programmed to control an audio player and LED lights with a micro-controller prototyping system, Arduino. On the outside of it, the custom ordered red square piece of traditional fabric wraps the basket with a typical Korean Bottari tie; a pair of diagonally opposite corners of the fabric are tied as shown in the picture. The two small speakers are attached on exterior of the basket and each has a distance sensor so it will detect anyone near by. When audience walks toward the Bottaries, they will be activated to speak random words and the red LED lights will flicker through the wrapper when voices are activated to play. Non-linear spoken words are extruded from short sentences of the artist’s writings about her different memories of senses and travel. Each voice speaks slowly in Korean, total about 100 words such as; “She” “wraps’ “a bottari” “again” “slowly” “A boy” “unwraps” “a gift” “sings” “remembers” “wet” “air” “sky” and so on. In first version of the installation project, “Bottari” was exhibited at the gallery, B2Project in Seoul for three weeks in April of 2011. The first version was composed of 20 electronic Bottaries with a mixture of 4 different voices of a girl, a woman, a boy and a man speaking in Korean. The next version is an interactive installation taking up one side of gallery wall with 30 – 40 Bottaries in English voices. When audiences walk by, they will activate random spoken words out of some Bottaries and will participate in composing a sentence. to post. Could you list of every one of your communal sites like your linkedin profile, Facebook page or twitter feed? It might appear so without any cultural context. There is an old phrase in Korean – ‘opening one’s bottari’ as telling a story. My understanding is that it might refer to a guest who arrived and opened up ones luggage (they used a bottari to carry stuff) – and naturally telling a story of ones journey or something. For me a bottari is a fabric that wraps a gift to someone, that packs for one’s journey, and that stores something that is precious. The voices also explains what bottari mean to us. It is too bad I’ve only recorded in Korean for this version. :-) I will list Linkedin profile here soon. Thanks for the comment!